Appearance: Standing at 5’6″; Pale yellow fur with a cream colored muzzle. Curled tail in a shape of a fish-hook. Ears are pointy, but can be seen folded halfway. Clothes: A rifle green military coat with tricorne hat over a headband, black boots as footwear and a sash with baldrics holding ammunition, tools, and weapons are worn. Strength: Elite soldiering which includes firepower and military leadership. Weakness: Sensitive to colder weather which reduces combat capability and reaction speed. Sergeant Zeke Kenner was born in the Mercan Federation, a land in the new world rumored to have limitless opportunities. He was raised in the Mercan capital, Whitmore, and spent his youth visiting frontiersmen and the Tuskega tribe. As a child, he was quickly taught to build homes and hunt game effectively. By the age of 16, Zeke enlisted in the Mercan Army to set up defense in the frontier. A powerful and rogue colony, known as the Republic of Alomia, seceded from the Federation and declared independence in hopes to conquer the Old World. The Mercans led a pacifist cause for peace to avoid international conflict, but the pacifist leader’s assassination led to a civil war. The origin of the name “Zeke” is his shortened native name of “Sekaruhar”, which means “Spear Dagger” Zeke is about 21 years old and has a calm, stoic personality. He is quick to anger due to the stress of war, but gets over it quickly. He hardly smiles, but does not mean he cannot be happy. Once a soldier, always a soldier, Zeke will lay his life down for the sake of others and takes orders from superiors with no complaint nor hesitation. He is in a hunter or hunted scenario with a Alomian leader in attempt to acquire a mystical treasure believed to be a super weapon. Since then, Zeke thrives for liberty and justice for all. 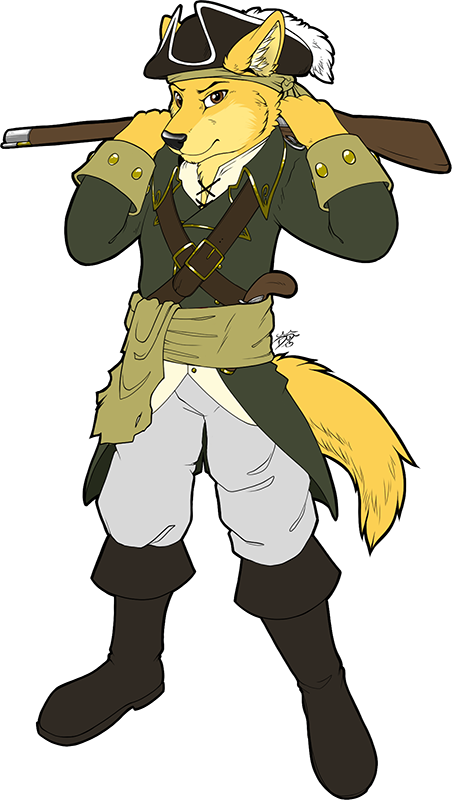 As a pirate, he is free from the world and in hiding from Alomia, carrying the heart of the Mercan Federation in him.